In concert with the notion of luxurious performance, HH Catamarans utilizes a push-button control system to raise and lower the curved "C" daggerboards in their HH55 and HH66 models. The company chose Vesconite as its bearing material for the board trunks. The polymer provides exceptional low friction, and the strength and tight tolerances needed to ensure the foils remain rattle-free, whether up or down. Vesconite was selected over other options due to its hardness, lubrication and machining properties. 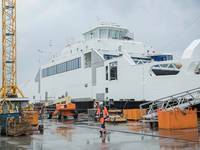 "It suits our usage very well," said Paul Hakes, HH Catamaran president. "And, it's a great company to deal with." From the bowsprit to the rudder, Vesconite is the perfect bearing material for sailboats. Internally lubricated, it has exceptional wear properties; even under load, it outperforms bronze and other technical polymers. It's extremely strong and stable, yet easily machined. 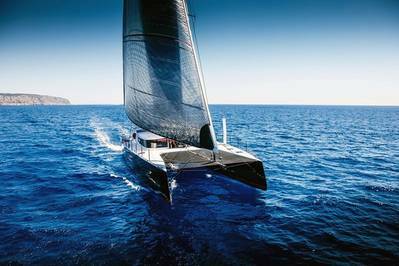 Readily available, the innovative material is a solid match to the state-of-the-art materials used by HH Catamarans. The Melvin & Morrelli-designed HH55 and HH66 utilize technologically advanced composites and build techniques. Their hulls and spars are constructed of carbon fiber for superior strength, safety and weight savings. Striking a bold pose on the water, the boats are lavishly appointed within. A perfect marriage of speed, sailing ability and cruising comfort, they truly define the modern, high-performance, luxury multihull.